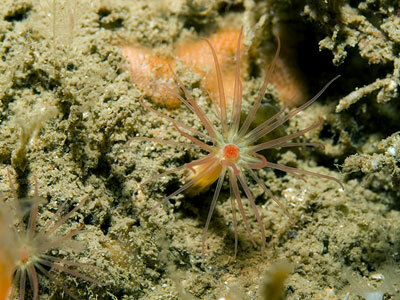 Description: A burrowing sea anemone with an elongated column with rounded base, divided into scapus and scapulus. Scapus with thick brown cuticle, scapulus translucent pink with white or yellow markings. 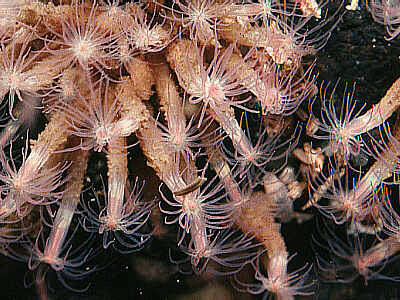 Tentacles long and slender, up to 32 in number, pinkish. Disc with white or yellow markings. Column up to 30mm long, 4mm diameter. Habitat: Lives in holes and crevices in rocks, often in large aggregations. Attaches to rocks by adhesive spots on base, which does not form a flattened disc. Occurs on the lower shore and in the shallow sublittoral. Distribution: Locally abundant on western coasts, occasional in the North Sea, known from most European coasts, possibly including the Mediterranean. 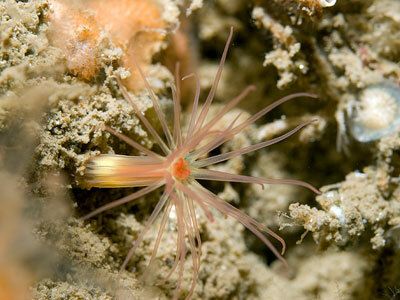 Similar Species: More likely to be mistaken for an athecate hydroid than any other sea anemone. Has a rounded base but does not burrow in sediment, living amongst rocks. Elongated body and small size. Picton, B.E. & Morrow, C.C. (2016). Edwardsiella carnea (Gosse, 1856). [In] Encyclopedia of Marine Life of Britain and Ireland.